White orange tip butterfly (Ixias marianne) complete detail. 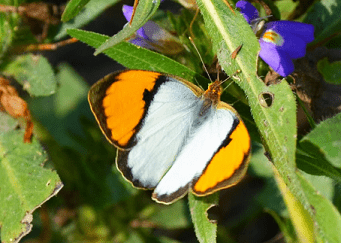 Description of White orange tip butterfly – Ixias marianne. 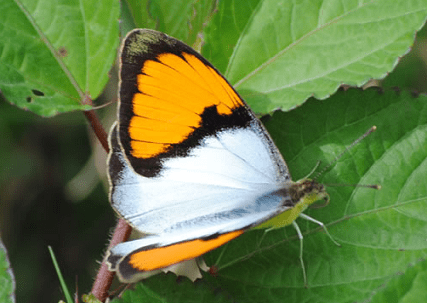 Classification of White orange tip butterfly (Ixias marianne). 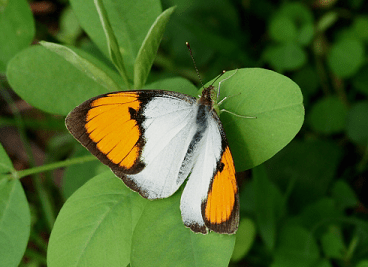 Habit and habitat of White orange tip butterfly (Ixias marianne). The color of antennae’s is reddish brown and the head and thorax anteriorly are covered with reddish-brown hairs. The underside is similar in both sexes, but females have slightly larger underside markings. They feeds on nectar from flowers. The flight is rapid and fluttering. Eggs – yellow and bottle-shaped, and laid in batches of 2 to 4, on ery fresh shoots of the plant and usually within two meters off the ground. The caterpillar hatches after 3-4 days. 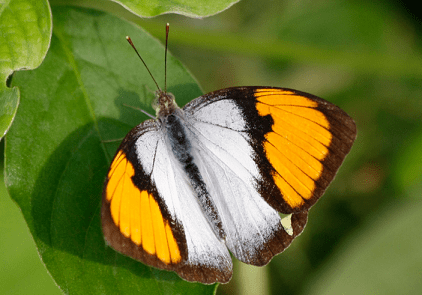 White orange tip is a beautiful butterfly, with a wingspan of 55 to 56 mm. The color of antennae’s is reddish brown and the head and thorax anteriorly are covered with reddish-brown hairs. In both sexes, the upper side of the thorax is gray with white hairs and the abdomen is black. The underside of head, thorax, and abdomen is white in color. In male Ixias marianne, the upper side of wings is chalky-white or light blue white, with broad black borders to the wings. There is a broad, rich, orange patch obliquely across the black area extended to the upper apex of the fore wing. The base of the fore-wings is grey and have a large, broad, orange patch. A broad black terminal border present on hind wings. Both fore and hind wings have a discal transverse series of reddish-brown spots, more or less conspicuous, the spots always centred with white. 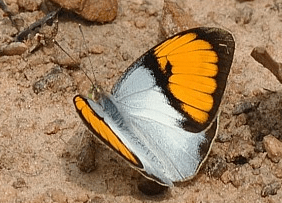 In females Ixias marianne, the base of the forewings is black and have a narrow orange patch containing four black spots. Both wings have a large black-white centred disco-cellular spot and a broad purple-brown band composed of conical, white pointed spots. She has a row of black spots in the orange wing tip. The underside is bright yellow with a few rusty brown spots on the hind wings. The underside is similar in both sexes, but females have slightly larger underside markings. Ixias marianne is confined to India and Sri Lanka. They prefer scrub-lands, dry deciduous forests, and open plains. They also found in savannahs, woodlands, open areas, beach hinterlands, agricultural land and mixed deciduous forests. Generally, they found among bushes and small trees. 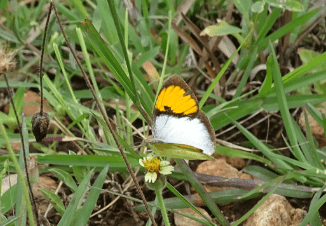 White Orange Tips are sun loving, and fly rapidly close to the ground. The flight is rapid and fluttering, and the wing-beats are continuous. They feeds on nectar from flowers. The food plant for the larvae is Capparis grandis, Capparis sepiaria, Capparis decidua, and Capparis divaricata. They are also fond of mud puddling. In morning, they often bask on low foliage, with the wings half open. They flying into long grasses or tangled undergrowth, where they hide low down, keeping their wings tightly closed, when disturbed. Eggs – yellow and bottle-shaped, and laid in batches of 2 to 4, on very fresh shoots of the plant and usually within two meters off the ground. The caterpillar hatches after 3-4 days. It is slender and cylindrical with a rounded and plain green head. The length of caterpillar is between 20 to 29 mm. The color of pupa is green or brown. The pupa is formed on the underside of a leaf. It is angular and the wing cases are parabolic in outline. A short, upwardly curved projection is present in front of the head. The length of pupa is between 15 to 19 mm.